All of our website images are of our guides is available, (click Print at the top right of the page). Where possible page code is written to industry standards and validated by W3C. Our website is compatible with all major operating systems and internet browsers. Online content has been tested on the following browser platforms: Internet Explorer 7+, Mozilla Firefox 3+, Apple Safari 3+, Google Chrome 1+. While we are happy for you to quote sections of our website on blogs and other publications we expect you to credit us and create a link back our homepage. We take plagiarism seriously and where necessary, work closely with CopyScape to protect our online content. Although we do all we can to ensure content is accurate and up-to-date we cannot be held responsible for any damage or inconvenience allegedly caused by published content. If we collect any personal information about you we will do it openly and fairly and explain how it will be used. Any personal information about you will be held securely, in accordance with the UK Data Protection Act 1998. We will never knowingly disclose personal information to any third party without your explicit prior written consent. A short text file called a cookie may be downloaded when you view a page. The cookie may contain information about your use of this site, such as how often and when you last visited. Any information gained from cookies will never be passed to a third party without your explicit consent. See your browser help files if you wish to disable these cookies. 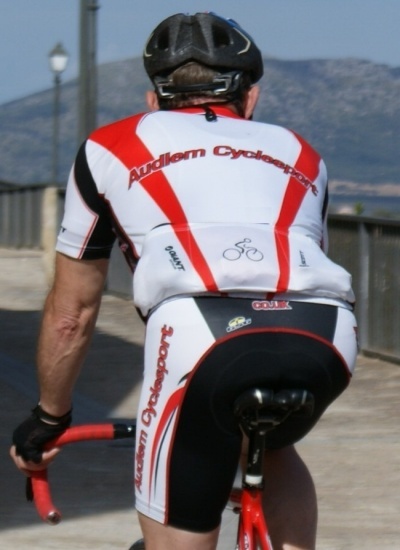 Audlem Cyclesport Kit - shirts and bibshorts in-store now !